This street is actually a dead end. This picture highlights the differences between a dead end, no outlet, and 'not a thru street' when the terms are appropriately used. A dead end is a spur of a road that terminates suddenly; many times trucks and buses are restricted from entering dead ends. A 'no outlet' street is one which may or may not connect to other side streets, but none of those side streets lead out any way other than the point at which the sign is posted. 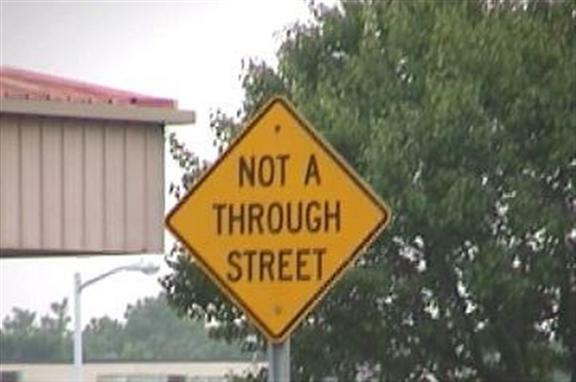 A street marked as 'not a thru street' is one that actually connects two other roads, but is not for use as a through street.